G-Touoker 3.5mm desktop Microphone makes recording vocals or instruments to your computer a plug-and-play operation No need the outside power input . It is Windows and Macintosh compatible, with no software to install, simply plug it into any available 3.5mm port, select it as your input in your software settings, and you're ready to create your own audio. -The wide frequency response and focused pickup pattern are Ideal for recording singing and musical performances in addition to spoken applications such as podcasting and voice-over. -You want something that just gets the job done, so you can get on with your creative work. 1.For Apple Macbook, you may need a usb sound card adapter to make the microphone functions well. And you need to set it on the Macbook. 2.For Notebook/ laptop/ tablet/ smartphone with only one 3.5mm combo headphone/ microphone port, a Headset Mic Y Splitter Cable Adapter is needed. 3. If you want better sound effect, a sound card could be used. 5.Cylindrical Metal crankshaft stent maybe occur security risk!!! Kids must be used under the guidance of adults, please place it in the safe position after use. 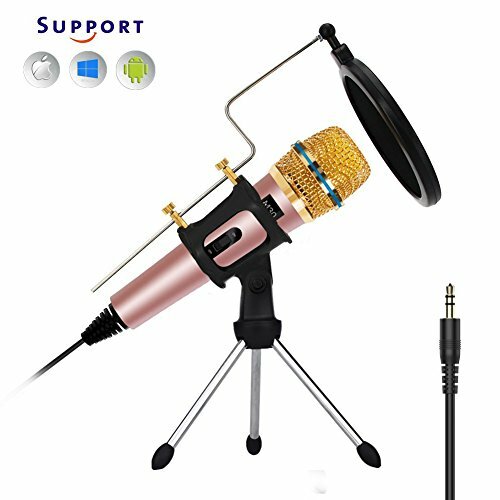 ✔Omnidirectional Condenser Stereo Microphone offers crystal clear audio for Skype,Messages,gaming and Facebook chating.100% restores your voice without any distortion, enjoy original voice and giving you the superior sound possible out of your vocal performances. ★DUAL-LAYER FILTER: Tabletop microphone mount comes with professional dual-layer acoustic filter to prevent from popping and improve vocal recording quality; adjustable distance between the mic and the filter. If you have any questions about this product by G-Touker, contact us by completing and submitting the form below. If you are looking for a specif part number, please include it with your message.